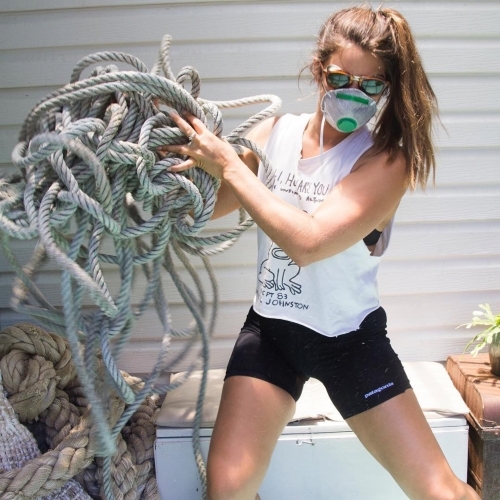 Jess Leitmanis wrangling oceanic debris rope in the studio. Join artist Jessica Leitmanis as she talks about her artwork and creative process, including debris clean up expeditions to remote parts of the Australian coastline where she gathers the raw materials for her sculptures. If you love art or creative weirdness, come along to my artist talk !!! I do one of those things very well, and I suspect it’s the latter. . Hear about the twists and turns of my creative process, how glamorous I really am, and the lengths I’ve been to for the acquisition of my precious crusty demons. .
Who wants to take a Hannibal Lector peek inside my mind?? 🙋‍♀️🙋‍♀️🙋🏽‍♂️🤷🏼‍♂️ don’t be shy. I’ll even let you ask questions. And if your very lucky I might even to a Tom Waits rendition as my voice is deliciously husky right about now. EXCAVATIONS OF THE DEEP is a series of woven sculptures created from marine debris rope, that explore the relationship between mind and matter. To what degree does our internal world influence our external world? To what degree does our environment influence our thoughts? Using archaeology as a framework, Jessica Leitmanis looks to the objects of our acquaintance for insights into contemporary society. She creates dialogue surrounding our constructs and design principles, in order to reflect on the values and beliefs of the modern world. Jessica Leitmanis is a sculpture artist with a strong connection to the ocean. Her primary medium, marine debris rope, has been salvaged from extremely remote coastlines across Australia. To acquire this material, she has travelled around the rugged South West of Tasmania by boat with South West Marine Debris Cleanup (twice), and to salty crocodile country, Cape York, with Clean Coast Collective and Tangaroa Blue. On these expeditions marine debris was hand collected, sorted, counted and data logged. Leitmanis returned home greedily with as much rope as her transport would accommodate. Her personal collection weighs in at over 700kg. Through her work Leitmanis explores ideas that encompass the environment, design, consumer culture, sustainability, sociology and philosophy. Leitmanis is interested in our connection to the space around us – how we sculpt our environment, and how it sculpts us. She considers our approach to design; the things we construct and the things we discard; to gain insights into our society and its values. In both 2016 and 2015, Leitmanis held a solo exhibition in Melbourne as part of Sustainable Living Festival, titled ‘Tomorrow’s Nest’ and ‘Future Sands’ respectively. She has exhibited work in group shows across Australia and New Zealand over the past 8 years. Leitmanis continues to cultivate her social inquiry, conceptual development and critical thinking. She graduated with a Bachelor of Design (Communication Design) from RMIT in 2004. She has practised as a design professional for 14 years. Hailing from the Surf Coast of Victoria, Leitmanis is currently based in Byron Bay, NSW and creates sculptures from her home studio. Jessica Leitmanis artist talk is on at Lone Goat Gallery 1PM Saturday 7 April.